The Australian Lunar series of coins epitomises the Perth Mint’s rich tradition of minting bullion coins portraying Chinese themes. The reverse design of this year’s release marks the 2014 Year of the Horse, one of the 12 animals associated with the ancient Chinese lunar calendar and the seventh coin in this series. In Chinese culture, people born in the Year of the Horse – 1918, 1930, 1942, 1954, 1966, 1978, 1990, 2002 and 2014 – are regarded as hardworking, sociable, optimistic and energetic. Each coin’s reverse depicts two horses standing within a stylised Chinese landscape. 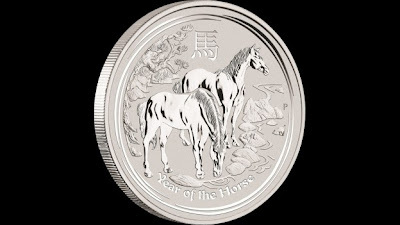 The Chinese character for ‘horse’ and the inscription ‘Year of the Horse’ also appear in the design with The Perth Mint’s traditional ‘P’ mintmark.